A lot can happen in a week. As some of you know, I have been dealing with a family crisis recently, so I'd like to thank those of you who continue to offer your kind words and support. A lot has happened in the market as well -- the S&P 500 (SPX) fell one point shy of my first downside target zone, then reversed strongly and went on to reach a new all-time high. Interestingly, on Thursday, SPX pinged the trend line which connects the 2000 and 2007 highs, then reversed (as seen, zoomed in, on the chart below). This is basically the last remaining horizontal resistance level, but it is a "doozy" as they say. The market has done its best to make us forget the potential of a long-term triple-top by ramming into it at high speed and looking invincible -- ironically, sometimes this means we should be on higher alert for a reversal. I genuinely don't have a strong opinion as to what will happen next right here, since the market is basically at resistance but still above support -- but I feel neither side can afford complacency at current price levels. There are a couple of signals in the chart below which bears may find encouraging: Note the Bollinger band indicator in the lower panel. These types of extreme readings are often found in the vicinity of tops. 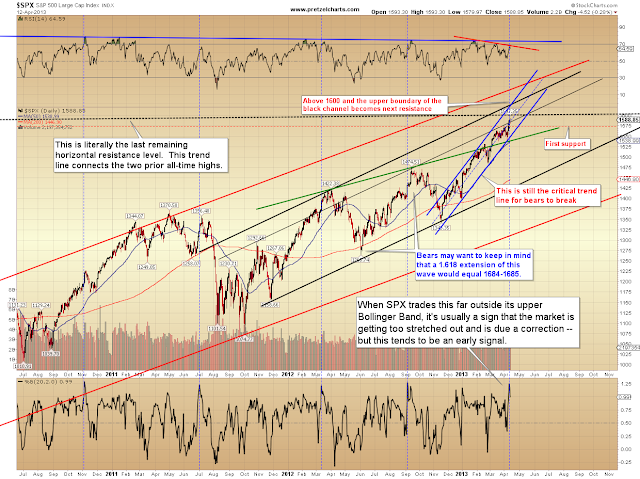 Daily RSI (top panel) is also continuing to throw off bearish divergences. 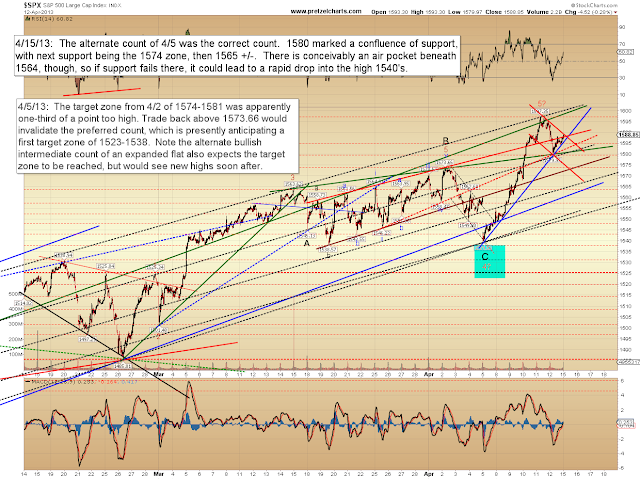 The 10-minute chart notes some updated trend lines and support/resistance levels. In conclusion, the market has finally reached the very long-term trend line which finds its beginning in the same year the country was trying to figure out what the heck a "dimpled chad" was. I'm not going to make any grand sweeping predictions about this being the end of the line for the rally, because I simply don't know -- but this is a long-term resistance zone, and the potential is there for a complete five-wave rally. 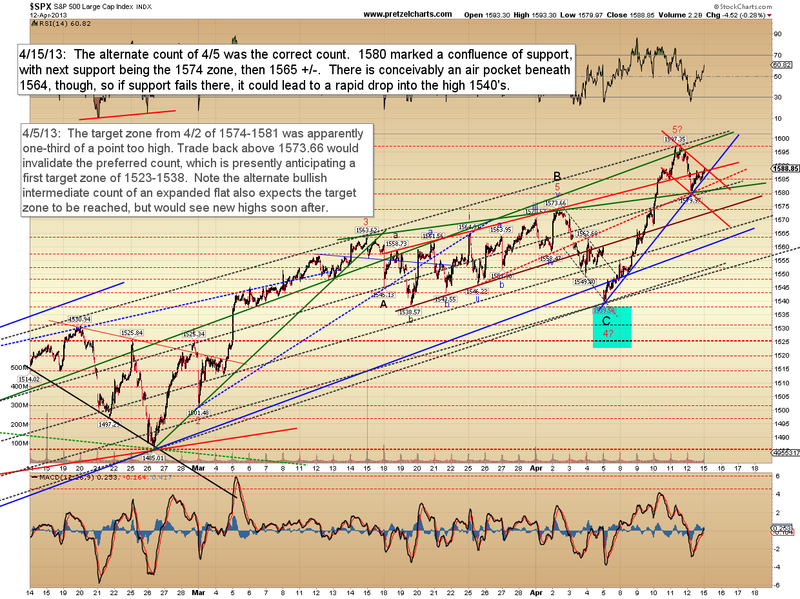 There are also a couple of indicator signals (shown in the first chart) which are often bearish. This is one of those markets where bears have everything going for them but the actual price action, which has continued to run higher. Some people refer to that as a bull market. Presently, there are no new targets, and this is more of a watch and wait position at the moment -- over the next few updates, the market will likely allow me to calculate some new targets. Additionally, we'll take a closer look at some of the long-term potentials and the signals to watch along the way. In the meantime, trade safe. Great to see you back. I echo what Abugarance says! Do you have any views on the price action in the PMs, Pretzel, and how it might (or might not) affect your long-term market outlook? Thanks Pretzel, great to have you back. When you have time I would also like your opinion on the massacre in the metals markets. Take care.